As Seattle Sounders FC prepares to celebrate 10 years in Major League Soccer in 2019, the club today announced a new jersey front sponsorship deal with locally-based online retailer Zulily. A company driven by attentive customer service in the digital age, Zulily is headquartered in Seattle, with corporate offices in Ohio as well as distribution centers in Nevada, Ohio, Pennsylvania and China. In addition to its new relationship with the Rave Green, Zulily is also partnering with National Women’s Soccer League side Seattle Reign FC. The partnership marks Sounders FC’s first new kit sponsor since joining MLS in 2009, ushering in a historic new era for the sport in the Puget Sound region, as both men’s and women’s professional teams unite under one community-focused partner. The designs of both club’s home kits remain the same as last season with Zulily replacing XBox as the Sounders’ shirt sponsor and Microsoft as the Reign’s. The Sounders are expected to unveiled their 2019 adidas away jersey in the coming weeks. Most MLS clubs wear kits for two years with alternating lanches of new shirts between their primary and secondary kits. 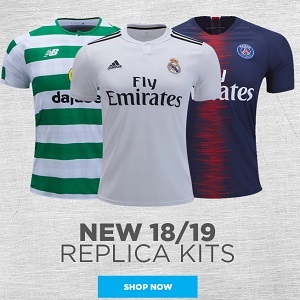 World Soccer Shop, Kitbag, Pro:Direct Soccer and UK Soccer Shop will all carry the Seattle Sounders 2019 adidas home and away jerseys.